Sooooo…I’ve been SO excited to share this recipe! And by share, I mean get it written down already so I can be sure of making (and eating) these scrumptious little squares again soon. I say little to reinforce the idea in my head that they are meant to be little. They don’t have to be, obviously. They’re squares. And they’re rich, plus naturally sweetened, so little bites do satisfy. That said, they’re really, really good and while you can stop at just one, you will probably be tempted not to. Thus, the personal reinforcement. Maybe you remember me mentioning how I get the New Year Blues? It happens every year, even when the new calendar opens up bright, auspicious days filled with promise. It really comes down to nostalgia more than anything, sometimes. This year, we have had a lot of brightness to be thankful for so far, which helped ease my bluesy notes quite quickly. Just as I was re-emerging, however, Dave seemed to come down with his own light case of sentimental sighing, and the cause was clear: a little British homesickness. Even the most reasonably, objective, take-it-for-what-it-is types are not impervious to the funny swings catalyzed by social media. The very platforms that connect us really have a way of making us feel isolated, too. Images of lovely Lake District scenes gave my husband a faraway look for a couple of days post-holidays, so what did I do? 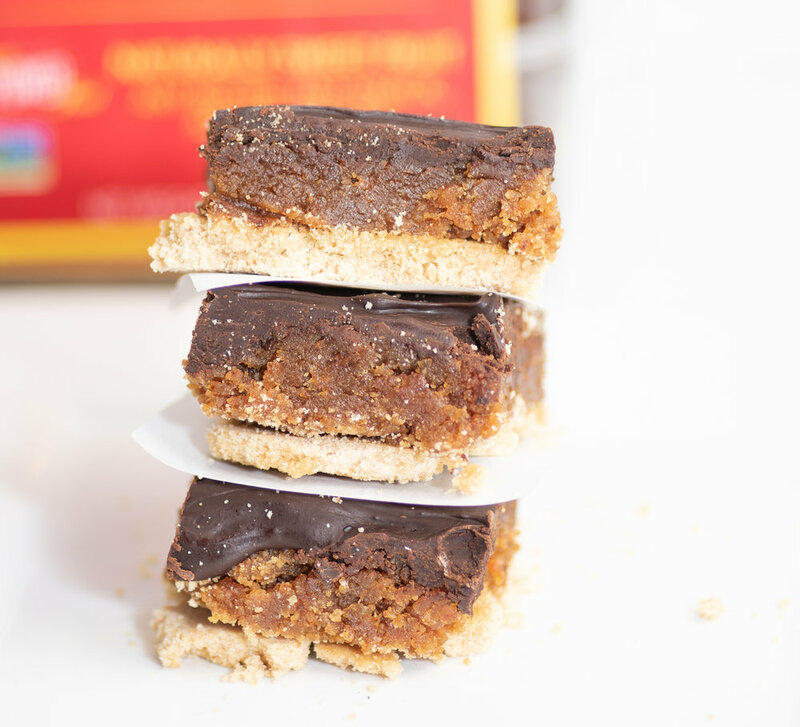 Now that I’m thinking about it, a hug would have been an awfully good remedy, but I was hungry, so I baked these millionaire shortbread bars instead, telling myself it would be a taste of home with a vegan twist. No matter I had never actually seen him eat one of the original versions. He loves mine so all is deliciously justified. This simple shortbread crust is a coconut triumph, without actually tasting like coconut: just combine coconut flour, coconut oil and some homemade powdered coconut sugar with a little aquafaba. Have you ever made homemade powdered coconut sugar? It is so easy and so worth it! Not eating a lot of sweets, you can stretch the stuff for quite a lot of goodness with just a minute’s whizz in a high speed blender. I followed this recipe from coconut mama, which is just a cup coconut sugar with 1 tablespoon arrowroot powder, though I’m sure corn starch works just as well. As crusts go, this concoction does make a really crumbly base, but the date mix is so sticky it’s all good. On that note, leaving out the caramel altogether and simply spreading a layer of chocolate would be pretty awesome, too. Not sure if I’ll ever try that, however. The medjool date-nut butter combination is what really makes these bars blissful to me. The dark chocolate topping is both beautiful bonus and perfect completion. These are easy to make and easily please, as far as we’re concerned. Let me know if your brilliant variations! Happy Valentine’s Day! Prepare the crust: combine all ingredients in a food processor. Mixture should be crumbly. Press into a layer in a prepared 8-inch baking dish. Bake 12-15 minutes, or until firm and just beginning to brown. Prepare the caramel: Depending on how hydrated your dates are, you may wish to soak them in water approximately 10 minutes, then drain, before preparing caramel. If they are quite moist, you can skip this step, but add 1-2 tablespoons warm water during preparation. Combine dates, peanut butter and vanilla in a food processor and blend until smooth. Add tablespoons of warm water as needed to achieve smooth consistency. Spread caramel layer evenly over shortbread crust. Gently melt dark chocolate chips in microwave or in a saucepan over low heat with a little water. Spread over caramel. Refrigerate or place in freezer until firm enough to cut into squares. Store in fridge of freezer.